Prepare the noodle by heat oil in a pan by low heat. 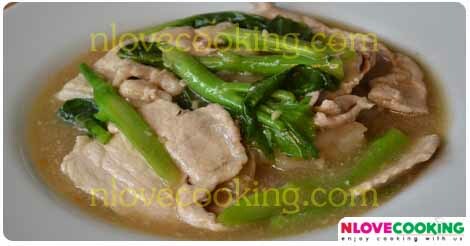 put big noodle to stir with soy sauce 2 tablespoon. stir it around 20 sec. and then put the noodle that already stir to a dish. Prepare soup by boil stock in a pot. and then put pork sliced , garlic, soy sauce, fish sauce, sugar and preserved black bean. put Chinese kale boil in a pot and then put corn powder water to boil in a pot . stir soup in a pot until it sticky. put soup in a noodle dish and then put pepper on top.